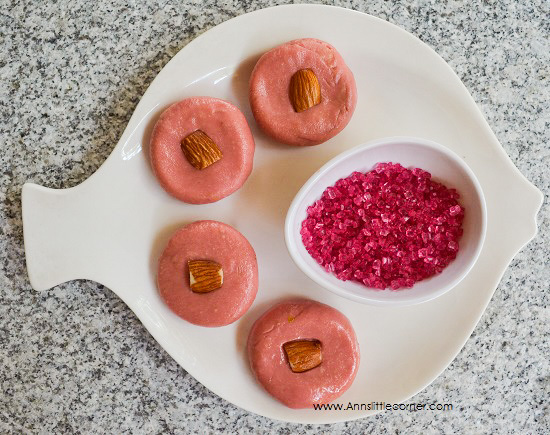 Rose Milk Peda / Rose Milk Fudge is a delicious indian sweet. 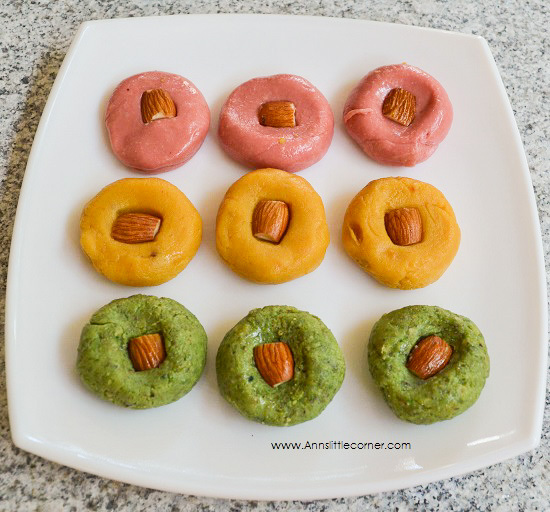 It is a simple variation from the regular milk peda. Rose extract is added which brings in the awesome color and the flavour. This recipe is prepared using condensed milk and milk powder. This is very easy over the traditional method of reducing the full fat milk and preparing the pedas. Anyone can try this peda as they are as simple as they are. I prepared these pedas along with Mango Milk Peda and Pistachio Milk Peda. I loved the Rose Peda over the other pedas. Use a Heavy bottomed Pan. Add in Condensed Milk and Milk Powder. Heat in low flame. Mix them so that they are blended well. The mixture gets set immediately. Add in the Rose extract and mix them gently. Add in ghee and mix them well. Switch off the flame immediately. Flatten them in your palm into desired shapes and add a roasted almond in the center. If the peda mixture is overcooked it becomes hard and difficult to shape them. Grease your hands while shaping the peda. The Mixture must be warm or it is difficult to shape them. Use a heavy bottom pan and cook in low flame or the mixture gets burnt easily. If you feel the peda is too sticky refrigerate them for 30 minutes before making the desired shapes. Shaping the pedas is ones own choice. It can be made into small balls like ladoos or cut into diamond shapes.